The Lifeline Service Finder is a tool available for people to search for local and national low or no cost support services within Australia listing results to keyword searches or browsing by category. This tool will show users a description and contact details of search results as well as other useful information. The Lifeline Service Finder is powered by Infoxchange Service Seeker, which was developed to allow people to access up to date, accurate information on health and welfare support services at any time of the day and night. 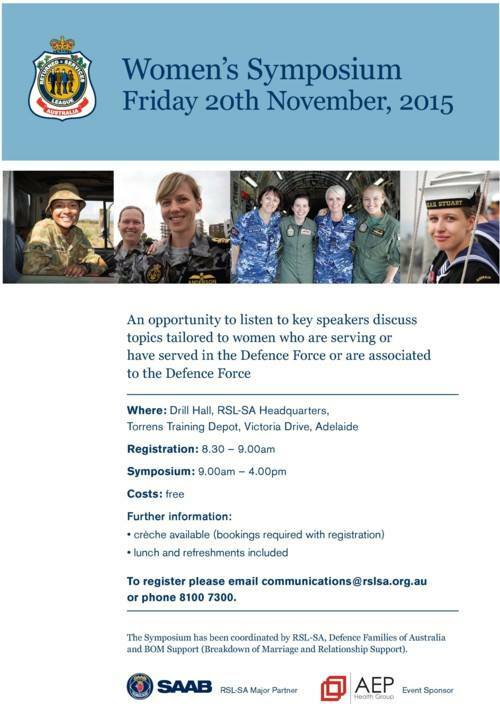 Women veterans have their chance to discuss their unique needs, hear key speakers, network and connect. Please TAG or SHARE with women veterans in SA. Information regarding TIP SA/NT training for 2016 is now available and can be viewed using the links above. At this point in time, courses have only been programmed to the end of June pending further clarification of the future of the TIP training process as a result of the proposed implementation of the Advocacy Training & Development Blueprint in July 2016. Refresher training for Welfare and MRCA will continue to utilise the on-line eLearning modules, allowing for this training to be completed at any time and at your own pace. Enhancement training courses in MRCA, SRCA, GARP and Non Liability Health Care can also be taken using eLearning modules. Training is normally conducted at the DVA office in Adelaide or in regional locations. This would be assessed by the TIP Consultative Group on a case by case basis. A nomination is required to attend all training courses (including the eLearning courses). For the 2016 course program, nominations can now be made on-line and can be accessed using the link above. This is now our preferred method of receiving nominations. ‘The Orderly Room’ continues to be the primary point of information for TIP SA/NT matters and we encourage you to visit this website on a regular basis. We look forward to seeing you at a training course in 2016. Current and former serving members of the Australian Army, Royal Australian Air Force and Royal Australian Navy. This also includes the partners and dependent children (up to age 26) of these members; and the partners, dependant children and parents of members killed in service-related incidents. Call VVCS on 1800 011 046 to see how they can help you or your family. Click here to review the latest Statements of Principles updates. The RMA website has been redesigned. The website has a range of improvements – a cleaner, less cluttered and more modern feel; improved and updated content and enhanced facilities to make navigation and finding exact information easier. These facilities include a comprehensive site map in the footer and a far more precise search facility at the top of each page. The new website is also easier to access and view from smart phones and tablets. The site features significantly improved capacity to search and find Statements of Principles (SOPs) – and other information. You can search by SOP number, year, the name of the condition or ICD code, and now hundreds of commonly used names of medical conditions can be entered in the search field to identify the applicable SOP. All information relating to a condition (the current SOPs, past SOPs, historical documents such as declarations or reasons for decision, and the most recent Explanatory Statements tabled in Parliament) are now available together in a single page relating to each condition. There is more information about how the RMA undertakes investigations, searches for relevant literature and assesses the medical-science. Requests for the RMA to undertake an investigation or review the contents of an existing SOP can now be lodged on-line, with the capacity to upload supporting documentation and print a copy of the completed request for your records.